To order any Xenca products, which can be posted directly to various different countries, please click here. Collagen is a key component in our hair, skin, nails and connective tissue, providing them with firmness and strength. Often called the ‘glue’ that holds us together, from early adulthood onwards our body produces less and less collagen resulting in a net loss of 1% or more a year. As a result bones lose density, skin loses firmness and muscles lose strength. 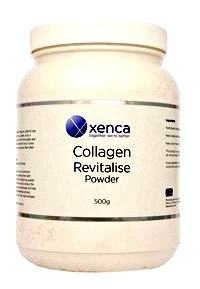 The Revitalise range of collagen aims to help combat this problem. Made with types I and III collagen (in the form of collagen hydrolysate for easy absorption), this nutritional supplement should be taken in conjunction with a balanced diet. The range includes both pure collagen formulations as well as supplements, which combine additional ingredients to target specific needs. 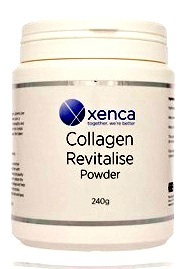 Many top sports professionals take Xenca Collagen Revitalise as it is so effective in aiding and speeding up healing. 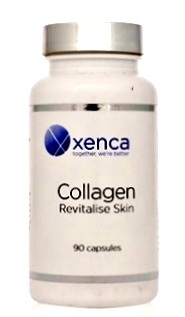 Here is a short video about Xenca Collagen Revitalise. 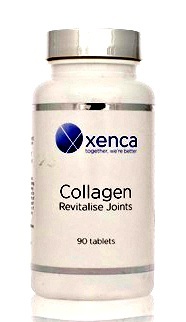 Numerous clinical studies have demonstrated the efficacy of collagen supplements in the treatment of degenerative joint disease. 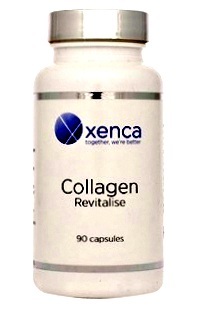 Other benefits linked with collagen supplementation include firmer skin, a reduction in fine lines and wrinkles, faster recovery from injury, stronger nails and healthier hair. For best results take the recommended amount of collagen with water before bedtime for optimal absorption during sleep. 90 capsules (3 capsules daily). Along with the healing properties of zinc and the antioxidant benefits of the vitamins, these natural ingredients are a simple way to give your skin an anti-ageing treatment from the inside out. For best results take 3 capsules with water before bedtime for optimal absorption during sleep. 90 capsules (3 capsules daily). Many people with joint pain and stiffness report significant improvement in their symptoms after taking each of the following: collagen, chondroitin, glucosamine and hyaluronic acid. 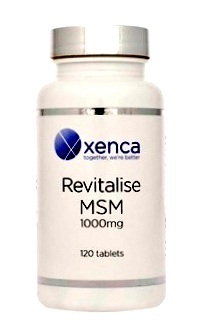 That’s why Xenca has combined all four ingredients into one tablet, along with MSM (Methylsulphonlymethane) and vitamin C for maximum efficacy. For best results take the recommended amount of collagen with water before bedtime for optimal absorption during sleep. 90 tablets (3 tablets daily). If you want to know more about the Collagen range, or other products of course, please feel free to contact us using the contact details below.